I've never had the best skin, years of acne has left my skin quite red and scarred so I've always relied on makeup to try and make it look as good as I possibly can. Recently I've found a few products that make me feel so confident and happy with how they look on my skin. I recently purchased the Too Faced Born This Way Foundation which I am absolutely loving. It's similar to something like Estee Lauder Double Wear and the L'oreal Infallible Pro Matte Foundations, really good coverage yet really lightweight on the skin. 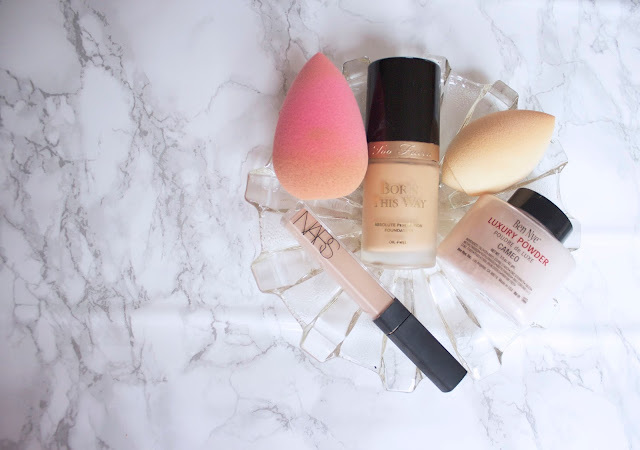 I apply it as I do with most of my foundations, with a slightly damp beauty blender and it blends flawlessly into my skin, I love the coverage as it is enough to cover my scarring really well and I don't need a ton of concealer to hid them. The concealer I use under my eyes and on blemishes is the Nars Radiant Creamy Concealer, I've used this for ages and absolutely love it! It doesn't dry my skin out, it has brilliant coverage and I find it so easy to blend in, it almost melts into my skin. I was looking for a powder to set my under eye concealer when I found the Ben Nye Luxury Powder in Cameo, the banana powder is a very well known for being used by Kim Kardashian. The banana shade looked a bit too yellow for my skin so I went with the Cameo powder. I started using this just on my under eyes to set my concealer but loved the finish it gave, so I now use it all over my face using a sponge. It makes my skin look amazing, my large pores are invisible and it just sets my makeup in place all day! What are your favourite products for a flawless makeup base?